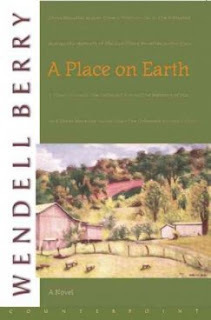 Blog Watch: "Wendell Berry and pastoral theology - Part 2"
As promised I will provide a sketch of another pastoral encounter in a Wendell Berry novel, this time from A Place on Earth, a novel in which land and community in the small Kentucky village of Port William are closely engaged against the backdrop of World War 2, the absence of young men from the community serving overseas. Wendell Berry cited in reflection on "Sarah Palin’s Alaska"
Of Interest: Food Art Manifesto - A Contest for Artists and Writers! As a follow-up to the Manifesto for a New Food Art (Click link to read), The Englewood Review is sponsoring FOOD ART MANIFESTO, an art and writing contest to encourage reflections by artists related to current conversations on food, place and the new agrarianism. Read the Manifesto for a New Food Art. While this document by no means calls for specific aesthetics or media, it does ask for artists to consider some basic ideals that have been associated recently with food, and particularly the new agrarianism (fresh, local, sustainable, etc. ), as normative also for art-making. Blog Watch: "Wendell Berry and pastoral theology - Part 1"
Doing some reading recently through some of Wendell Berry's novels I was struck by his account of a number of incidents of death and dying and attempts at pastoral visitation. I thought that these rich accounts of the interaction between the minister and the families might prove a rich source for reflection by those involved in such visitation. Certainly there is a substantial cultural difference between early 20th century Kentucky the situation a century later in Australia. Nevertheless, I reckon there is still something to be learnt particularly for engagement in pastoral care with people who are members of the Christian community. Stories such as this are a great source of material for reflection as they are interesting to read and rich in substance and nuance in a way that formal case studies can never be. Blog Watch: Reflecting on Wirzba's "Dark Night of the Soil"
When the illusionment of our religious speak and lust for the transcendent collides with the naked disillusionment of everyday experience we catch a glimpse of the sacredness of place. It is here amidst the paper jams, car rides, board meetings, runny noses and broken relationships that we glimpse something of the character of the Divine. Mr. Carlson has set "Desolation" and "The Wheel" to music well worth hearing. His lyrics to the WB pieces and all the others as well can be found HERE. Today the second hour of the Dianne Rehm Show consisted of a discussion on Wendell Berry's Hanna Coulter. Needless to say, the ability of the commentators to miss the point was entirely unastounding. More disconcerting than one commentator's positing that Berry returned to farming do to nostalgia for cow patties, was the Episcopal bishop's recommendation to a caller - "preaching" as she called it. To the man who spoke of his desire to have the type connection to community in place that Berry writes so eloquently about, she recommended seeking out a mosque, temple or "…um…what's it called again… oh right… church." Such communities still exist there, she asserts. Simply ridiculous. Seeking out similar people based on self identity, due to dissatisfaction with not knowing one's neighbors, is not in anyway similar to a connection to a real community based in place. Blog Watch: "Wendell Berry and the Sacred Task of Writing"
There are many things that I would describe sacred. Hearing a choir sing a favorite anthem, resting in the woods by a creek bank, witnessing the birth of one’ own child, listening to a person tell their own story – all of these things become sacred moments. Anytime we can stop and realize the essence of life in its beauty, love, hardship and struggle we are engaged in sacred time. Whenever I am privileged to listen to someone read a poem that they wrote themselves, I regard that as sacred time. The Diane Rehm Show: "Readers Review 'Hannah Coulter' by Wendell Berry"
Diane invites listeners to join a discussion of "Hannah Coulter" by Wendell Berry. Hannah is an old woman who has experienced much loss but has never been defeated. Hannah is a twice-widowed mother of three. She finds herself reflecting on her childhood, her loves and loss, her children, and her beloved Kentucky farm life. Wendell berry is a renowned poet, author, essayist and farmer. He has set many of his stories, including this one, in the fictional town of Port William. "Hannah Coulter" is the story of the ties that bind a community. Contributors include Jane Holmes Dixon, Jason Peters, and Andrew Wingfield. Follow the link and click on "Listen" at the upper left.